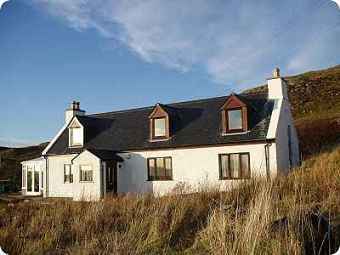 Stonechats Croft is a working croft in Sutherland, in the Scottish Highlands, offering bed and breakfast and self catering accommodation. We are also Biker Friendly so if your touring the west coast of Scotland you can use our accommodation as your base. My name is Ron and my wife's name is Elaine and we welcome you to Stonechats Croft. Our aim is to offer you affordable, home from home, quality accommodation. Somewhere to relax and unwind or pursue your chosen sport. For more information please read below and use the links above. Stonechats Croft is a working croft in the Scottish Highlands and it has been said we have the most wonderful views in the whole of the UK. The croft land goes down to the Atlantic Ocean and Badcall bay which is ideal for the sea kayaker and those that fish. If you are a photographer that loves wildlife, nature and surreal cloud formations with the most amazing colours, this place is for you. For hill walkers there are some of the best walks in the UK in the area. 15 minutes from the croft is the world famous Sandwood bay, said to be the most romantic beach in the world, also the prettiest in the UK. There are resident sea otters on the croft and regular visits from the white tailed sea eagle. From the croft Mount Suilven and Mount Quinag are clearly seen. This part of Scotland is said to be the last wilderness in Western Europe. Next to the croft is the Kylestrome Estate with some spectacular walks round loch Glendhu and Glendhu forest. The world famous Handa Island is 5 minutes drive away, so if its puffins, razorbills, black throated divers and buzzards this place is perfect for those that love bird watching. If its isolation you want, Cape Wrath is close-by which is the most north-westerly point of Europe. Close to Cape Wrath at Durness is Smoo Cave where the Celtic tribes lived 5,000 years ago. Also in Durness is a museum dedicated to John Lennon as he spent much of his childhood holidaying in Durness. If it is a night out you want, to sample the best sea food in Europe and listen to some traditional folk music, Ullapool is only a short drive from the croft. Stonechats Croft is open all year so if it is a winter break you need to relax and escape the modern world, this place is perfect. We offer two types of accommodation, bed and breakfast in the Croft and self catering in our Mobile home. Our Croft has two bedrooms, one with a double bed and the other has twin beds. Both rooms are en-suite and both have stunning views of the Assynt Mountain range and Atlantic Ocean.